Wilderness Girl began with a line I distinctly heard spoken in my head. No, I don't normally hear voices; it's never happened before, and hasn't since. But it was enough to launch this story. First, a little backstory on the voice. I love to garden (though this year my gardens are a miserable failure, but that's another story altogether). Unfortunately, we live in an area where snakes are prevalent. Not just one type of snake, but several, including poisonous copperheads. When I was little, I loved to collect all sorts of slimy reptiles and bring them home, including snakes. Now, of course, I prefer to avoid snakes altogether. One of the perks of age is reason, I suppose. :) But one rather long black snake would regularly slither through our yard on his way to doing snake business wherever. Weeding one day, I had a close encounter, and (here it is...) heard the voice. What did it say? Very clearly, I heard: **ck me till I'm blind. As I mentioned yesterday, guys on motorcycles really intrigue me. Not necessarily bad boys, they usually think a little more independently than guys, say, who drive compact cars. Whenever I see a couple on a bike, they always look so in synch with one another, physically as well as emotionally. They look happy. 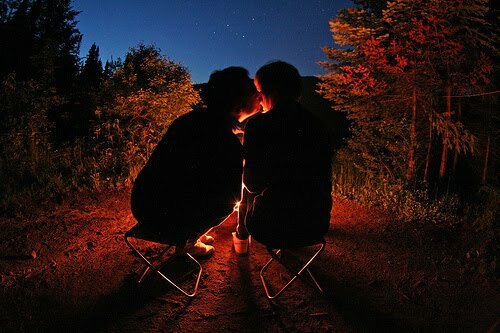 Camping's one of those activities where couples need to be in synch with one another, and depend on one another. Not only to look after their partner's welfare, but their emotional well being too. I'm sure it's a great test of relationship strength as well. Like most of the characters in my stories, Hank and Dana emerged from the deep shadowy recesses of my brain fully formed. I had to get to know them a little, but as usual, too, it was like getting reacquainted with old friends. I hope you'll come to know and love Hank and Dana as much as I did. One final note, about the trailer. The incredible music was composed by Michael Eli, who generously allowed me to use it. I erroneously attributed it to the band Soul Custody in the credits. but it's Michael's sole composition. It's so beautiful, I let it run a little longer than the video. 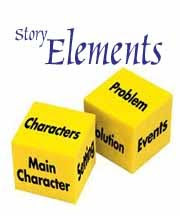 You can view the entire Story Elements series (so far) by entering the key words Story Elements in the search box to the right. The guy at Wilderness Outfitters had been right. This seemed an excellent spot. The slope offered a perfect view of the stream at the bottom of the hill. But where was he now that she needed him? Probably having a good laugh, imagining her here by herself. The only other vehicle in the parking lot was a motorcycle–obviously not another camper. Perhaps he’d never intended to show up at all. Maybe he’d gone back to the coffee shop that night and made plans with the Frappacino Girl. Should she head back to the car? She’d have to gather everything up again, trek back through the woods…. No. Going back meant giving in to failure. Next, she’d be sitting home on weekends, feeling like a complete loser. She’d never been that girl, and she wasn’t about to start now. The instructions. Though they read like something translated from Japanese to Greek to English, maybe the illustrations would be of some use. She bent to retrieve them. When she reached for the pole, it moved. Oh good God. A snake. Four feet long, maybe five–hard to tell, after panic set in. Looking at her with its beady black eyes, flicking its awful tongue. Why, of all things, did it have to be a snake? She’d rather have wrestled a grizzly. Happy to leave the city-dwelling man-snakes like Sean behind, she hadn’t thought about the possibility of facing the real thing. She should have known better than to take off into the mountains alone. Her cell phone had zero reception on this hill. If the thing bit her, she’d die out in the wilderness. Behind her, a twig snapped and leaves rustled. She didn’t dare look. With her luck, the bear had arrived to take on her challenge. She turned her head ever so slowly. It was him! Wilderness Guy. He looked even better than the night they’d met. His sparkling gaze danced across her in appreciation. The way he looked at her made her want to peel off her clothes layer by layer, to see the pleasure in his face grow. Relief gushed over her, her earlier disappointment forgotten. Disappointment returned. He’d seemed so nice at Wilderness Outfitters, but here he was, acting like they were at a singles bar or something. Oh damn. The snake–she’d forgotten for a blessed second. It coiled upon itself and raised its head. Its tongue darted out. “Oh no….” She fought her buckling knees. “Stay calm.” His low voice fanned embers of the fire she’d felt that night in the store. He slunk toward her like a warrior stalking an enemy. 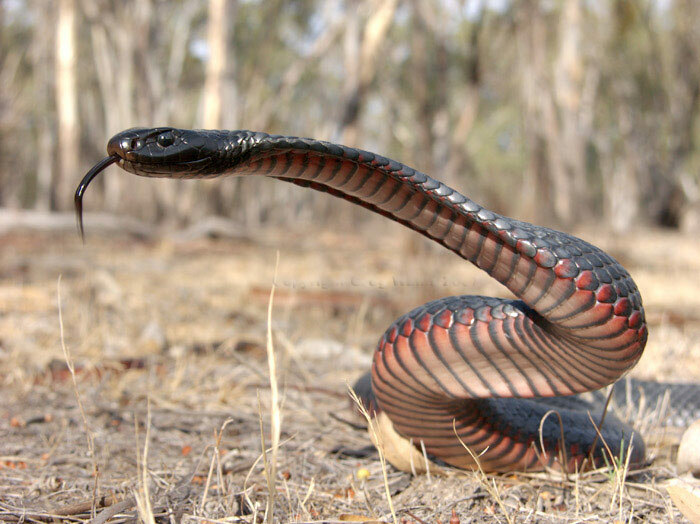 Graceful as tai chi, his serpentine movements mesmerized her. No wonder the reptile watched him as though he were a snake charmer. He moved nearer and her muscles tightened, imagining him melding into her embrace. When his arm grazed hers, she gasped. His touch felt electric, magnetic, just as it had the night they’d met. She opened her mouth to argue. Before she could form the words, he lunged downward. One hand below the serpent’s head, the other in the middle, he lifted it into the air. Man and reptile twisted in a tangled dance down the hill. Her heart raced. The scene played like a primal ritual. He proved such a hot and skilled warrior. She followed, unsure what to do. What if it bit him? Old movies came to mind of cowboys cutting the skin of a snake bit partner, sucking the venom out. Ugh! Never again would she go camping. Her gear would be on eBay as soon as she made it home. With halting steps, he made it to the creek, wrestling the snake at arm’s length. In one final twist, he bent at the water’s edge. It shot from his hands and disappeared into the stream. “Yeah.” Wiping a forearm across his brow, his dark eyes searched hers. “I’m shaking all over.” The snake aside, his six-pack abs and leg muscles resembling a personal trainer’s could account for the bulk of her trembling. He watched her. Studied her. Her jaw hung open like a gaping moron; she realized too late, and snapped it closed. He bit his lip and burst out laughing. “What?” Why was he laughing? Maybe he’d realized what he’d done, and hysteria had set in. She wanted to wrap her arms around him, to comfort him, to bring him back to the moment, but he convulsed with giggles and chortles. He slowed down several times before exploding all over again. Holding his stomach, he wiped at his eyes, but when his gaze met hers again, he chuckled. “I’m sorry.” He held his hand to his stomach, watching her concern turn to confusion. He dipped his hands in the crystal water and splashed his face. “Oh man, I needed a good laugh.” Tendrils of damp sandy brown hair curled around his neck. “I don’t follow. Was that supposed to be funny?” The scent of a setup began to fill the air. Her cheeks burned. “Garter snakes. Like that one.” So he wasn’t being careless by teasing her while the snake cozied closer.